We are a Model Engineering Club, near Hornsby NSW. 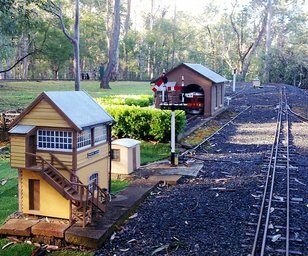 We have an extensive 5" gauge miniature railway, with a main-line length about 1 km, and running through a delightful natural bush setting. Rides are available on our monthly Public Running Days. We also have a large G1 layout which is being developed with scale buildings and which is a 'must see' when you visit. Our most valuable resource is a very keen membership interested in many different aspects of model engineering. We are twinned with York City & District Society of Model Engineers Ltd., in the UK. If you have a passion for railways or an interest in any aspect of model engineering, please see our Members page. You don't need to be an accomplished engineer! Please note that all train passengers must wear fully enclosed footware - not sandals or thongs! We suggest you wear older clothes when visiting us. We cannot be responsible for damage to clothing or personal property caused when visiting our bushland venue and / or riding on trains.